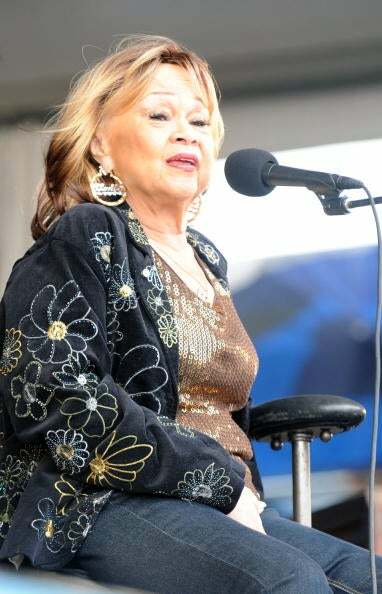 Music legend Etta James' family fights over her estate. Christine Pelisek of the Daily Beast is reporting that the battle between the husband and son of Etta James continues as the legendary singer fights for her life. James, 73, suffers from dementia, leukemia and numerous other ailments. She is now bedridden at her ranch-style home in Riverside County, Calif. Pelisek writes, "Her son, Donto James, claims he has power of attorney over his mother's affairs while her husband, Artis Mills, says she was in no condition to give him that sort of power. James' erratic behavior at the time — which ranged from dozens of performances to strange comments and cancellations — have made this 'he said, he said' all that much more difficult to decipher." The drama began last year when James' husband and tour manager of 41 years filed a petition to gain access to three of the singer's bank accounts, estimated to total around $1 million. He said he needed to pay for her business affairs and mounting medical bills. Mills says he spends around $30,000 a month for private medical care, which includes two full-time nurses and a round-the-clock doctor. The following month, James' son Donto, a drummer in his mother's band, filed legal papers asking the court to grant him conservatorship of his mother's estate. He also asked that the court appoint an independent administrator to handle her finances. There has been no mention of a living will. Donto, who is Mills' stepson, also questioned whether his mother is getting proper care by her $20,000-a-month live-in doctor, Elaine James. Wow, this story has more twists and turns than a back-in-the-day soap opera. The saddest part about it is that a legend known for having the voice of a lifetime can't speak up and say what she wants for herself. The lesson in this is to have a will, which would end all of this drama so that the family could concentrate on James' last days here on this earth instead of fighting over her estate. In other news: Obama and O'Reilly Team Up for Charity.